These scripts include clinical scripts and as well adminsitrative scripts which are useful to other sites as a reference. 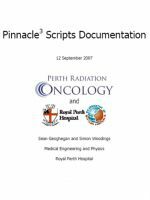 The scripts contained in the distribution are described in an included reference document(the table of contents are below) and the scripting language is described in an included scripting manual written at Perth Radiation Oncology and Royal Perth Hospital. THe scripting manual is separately downloadable from MedPhysFiles and is identical to that stand alone document.